Dominion branded Komatsu tracks feature Continuous Wrap Technology which ensures there are no weak points in the track by using a coated single steel cable to construct the track. 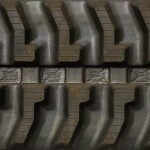 Our Komatsu rubber tracks are half pitch tracks with twice as many lugs as a full pitch track. Every sprocket tooth will grab a lug resulting in a smoother and more comfortable ride. 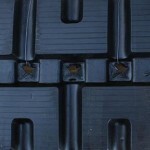 Can't Find Your Aftermarket Komatsu Replacement Track?